Fish, benthic invertebrates, macrophytes and benthic diatoms are differently affected by environmental degradation. While hydraulic alterations, for instance, may impose a strong negative impact on fish assemblages, this may be less strong for macrophytes: the intensity of responses varies across riverine assemblages and environmental stressors. In selected cases response to stress may even be positive; hence the sign of response varies too. Eventually, the stress levels of organism groups at which a response can be detected vary notably and reveal a dissimilar sensitivity of biological assemblages to stress. There is empirical evidence that river biota are almost always sensitive to general degradation (mixture of non-distinguishable stressors), land cover and water quality degradation, as opposed to hydrological and morphological degradation which affects could be less reproduced (Table 1). The response of fish to agricultural land use in the catchment, for instance, depends on the spatial scales considered for the calculation of percent land cover. Diatoms and macroinvertebrates respond most strongly to general degradation already at low stress levels. These organism groups are weak indicators of local habitat improvement in degraded catchments, i.e. both groups are unlikely react to restoration unless broad-scale impacts are being remedied. Besides general and water quality degradation, fish and macroinvertebrates respond most intensively to morphological degradation, structural modification and catchment land use. Fish respond strongly to hydrological degradation, too. Hence, river fauna reveals a more intense, but not necessarily more sensitive, responses to stress, compared to the flora. Overall, aquatic macrophytes were found to be comparatively weak indicators of the stressors considered. Assessment and monitoring systems must account for the different capabilities of river biota in the detection and indication of single and multiple stressors. If multiple stressors act in a catchment, the use of a single assemblage only is likely to be insufficient and may lead to the wrong conclusions regarding the appropriateness of management or restoration measures. River Basin Management must address and reduce all stressors relevant for ecological status. In agricultural or otherwise widely degraded watersheds, the impact of fertilizer and pesticide application, soil degradation and runoff modification is often omnipresent and can easily superimpose other, rather local impacts of structural and habitat degradation. 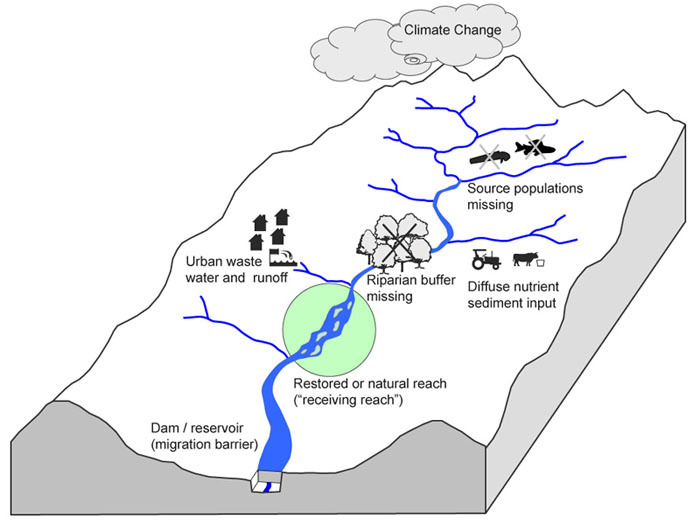 Consequently, any local restoration in agricultural catchments must account for such large-scale impacts upstream of a restored site to initiate biotic recovery. In depth analysis of empirical data is available through WISER Deliverable 5.1-2. The conceptual linkages of environmental variables and riverine biota is available through WISER Deliverable 5.1-1 and Feld et al. (2011) (link to article). The conceptual models of linkages can be accessed and used interactively in the results section. Allan, J.D. (2004). Landscapes and riverscapes: The Influence of Land Use on Stream Ecosystems. Annu. Rev. Ecol. Evol. Syst. 35, 257-284. Hering, D., Johnson, R.K., Kramm, S., Schmutz, S., Szoszkiewicz, K. & Verdonschot, P.F.M. (2006). Assessment of European rivers with diatoms, macrophytes, invertebrates and fish: A comparative metric-based analysis of organism response to stress. Freshwat. Biol., 51, 1757-1785. Paul, M.J., and Meyer, J.L. (2001). Streams in the urban landscape. Annu. Rev. Ecol. Syst. 32, 333-365. Landscapes and riverscapes are organised hierarchically (Table 1). For example, catchment geology and geomorphic features determine substrate particle quality and size, whereas current velocity is a function of river slope and discharge. Hence, broad-scale landscape factors can largely control local habitat conditions. This hierarchical relationship also applies to stressors, such as catchment agriculture or urbanisation, both of which can largely determine segment-, reach- and habitat-scale water quantity and quality. Besides these spatial hierarchies, there is also a qualitative hierarchy of stressors, for instance, water quality problems can superimpose hydrological and morphological conditions. There is a tremendous body of literature, which has been reviewed, summarised and illustrated by Paul and Meyer (2001), Allan (2004) and Feld et al. (2011). In brief, catchment-wide (often referred to as watershed-scale) urbanisation can severely degrade river hydrology and lead to enhanced frequencies and strengths of peak discharges (low uncertainty). The percentage as impervious area in the catchment is a good proxy measure to estimate the degree of degradation. The percentage of agriculture in the catchment is a suitable indicator of nutrient and fine sediment pollution, both of which severely degrade riverine habitats, down to the estuaries and coastal waters (low uncertainty). Further empirical evidence shows that broad-scale agriculture and its direct impacts (e.g. eutrophication) are superior over stretch- to local-scale stressors (e.g. structural degradation; Table 2). Percent of agriculture in the catchment (and in riparian buffers along river stretches) and eutrophication revealed the strongest relationships to compositional and functional metrics of all tested assemblages (low uncertainty). In another context, hierarchy refers to the strength of one stressor over another, irrespective of the spatial scale considered. Water quality deterioration (pollution, eutrophication) always overrules the impacts of hydrological and morphological degradation (Feld et al. 2011) (low uncertainty). In part, this is supported by empirical results presented in Table 2. Agriculture (through fertiliser application and erosion) can lead to eutrophication, which directly affects the water quality and was found to be strongly related to all tested BQEs, in particular the percentage of arable (crop) land in the entire watershed above a site. The hierarchical relationship between broad-scale stressors and reach-scale habitat conditions implies that restoration at the local scale is unlikely to initiate ecological recovery unless broad-scale impacts upstream are managed in parallel. As catchment-wide restoration is unrealistic within the time-scale of the WFD, practitioners plan measures bottom-up. Smart and adaptive concepts can help design measures so that multiple local measures can synergistically combine to ecological recovery at the larger segment scale (compare Table 1). Thereby, river basin management must not neglect water quality problems when they are obvious; they may continue to impact rivers even after extensive hydromorphological improvements. Detailed results can be derived from the sections by Marzin et al. and Dahm et al. in WISER deliverable 5.1-2. The importance of land use for structuring riverscapes is reviewed in Paul and Meyer (2001) and Allan (2004). Allan, J.D. (2004). Landscapes and riverscapes: The Influence of Land Use on Stream Ecosystems. Annu. Rev. Ecol. Evol. Syst. 35, 257–284. Feld, C.K., Birk, S., Bradley, D.C., Hering, D., Kail, J., Marzin, A., Melcher, A., Nemitz, D., Petersen, M.L., Pletterbauer, F., Pont, D., Verdonschot, P.F.M. & Friberg, N. (2011) From natural to degraded rivers and back again: a test of restoration ecology theory and practice. Adv. Ecol. Res. 44, 119–209. Paul, M.J., and Meyer, J.L. (2001). Streams in the urban landscape. Annu. Rev. Ecol. Syst. 32, 333–365. The hierarchical order of landscapes and riverscape implies a hierarchical order of stressors. Stressors, such as land use or river regulation, are ubiquitous in large parts of the world because of the multifaceted land and water uses. Flood protection is usually linked to severe modifications of hydrological and morphological characteristics. Agriculture increasingly dominates entire regions due to society's growing demand for food, resources and energy. Broad-scale stressors impose serious problems for restoration and recovery. Not only do, agriculture and urban settlement control habitat conditions at finer scales, but land use impacts have often been present for decades or even centuries in many regions, e.g. in Central and Western Europe. Thus, the legacy of land use past may continue to impact entire river basins or sub-basins as long as such impacts are not being mitigated by appropriate (broad-scale) management schemes. Urban settlement and agriculture in the catchment upstream of a site largely influence and control the physical habitat conditions at the respective site. Urban settlements can influence water retention and storage through the percent of impervious area in the catchment, which in turn affects the hydrograph and can lead to severe flash floods following stormwater release. Less than 10% urban settlements in the catchment are frequently reported to significantly reduce biological and ecological quality (Paul and Meyer 2011). The major impact pathways of intensive agriculture are nutrient enrichment (eutrophication) and excessive fine sediment entries (habitat loss). While nutrient enrichment can directly affect algal and plant communities, the loss of coarse substrates affects fishes and invertebrates. Naturally vegetated riparian buffer strips not only can buffer impacts from agriculture, but also provide habitat (woody debris, leaves), shelter (root wads, shade), food (wood, leaves, terrestrial insects) and energy (carbon and nitrogen) to the riverine assemblages (Allan 2004, Feld et al. 2011). Aquatic assemblages (e.g. fish and macroinvertebrates) significantly change their structural and functional composition, when the percent area as agriculture upstream exceeds 20% in mountain ecoregions. Lowland assemblages seem to respond less sharp to agriculture and significantly change values at 30-50%. These findings are in line with the thresholds reported by previous studies (e.g. Allan 2004). Near-stream buffer areas along several kilometres upstream can help maintain biological diversity and functionality at a site, if a minimum of 40-50% within the buffer area is covered by forest. Ecological recovery may be promoted already by a minimum of 25% forested buffers upstream. Yet it is important to note that the increase of forest cover alone is unlikely to mitigate the impacts of land use. Intensive agriculture and other land uses characterise large parts of Europe and constitute potential broad-scale stressors for riverscapes and its ecology. This in particular applies to the agricultural lowlands of Eastern, Central and Western Europe. Without appropriate mitigation and management, the negative impacts of land uses are likely to continue to impact rivers and hence hinder recovery, irrespective of hydrological and morphological improvements. Consequently, restoration and river basin management must adequately address land use impacts. That is, restoration measures are required that i) are capable of mitigating land use impacts and that ii) address the appropriate scale of impact. Riparian buffers can be considered best practice. For instance, mixed riparian buffer strips (trees, shrubs, grass) have been proven to effectively retain nutrients and fine sediments from adjacent crop fields (see Feld et al. 2011 for a review). Buffer strips require several kilometres of length rather than tens or hundreds of metres. Eventually, given the omnipresent character of agriculture, a re-organisation of land uses is needed and as a part of future river basin management. Conversion to less intensive land use forms in riparian areas will be most effective. This would require the reorganisation of agricultural policies in parallel. Detailed results can be derived from the sections by Feld and Lorenz in WISER deliverable 5.1-2. Two previous statements address the predominant role of broad-scale stressors that may act at the scale of entire (sub-) catchments and consequently may impact any site within the catchment. Consequently, river restoration is more likely to initiate and maintain biological recovery, if such broad-scale impacts are either completely missing or being mitigated in parallel to restoration at the fine (local) scale. There is empirical evidence from restoration monitoring that restoration measures can initiate biological recovery, if the physical habitat conditions several kilometres upstream of the restoration are only moderately modified or in better condition. 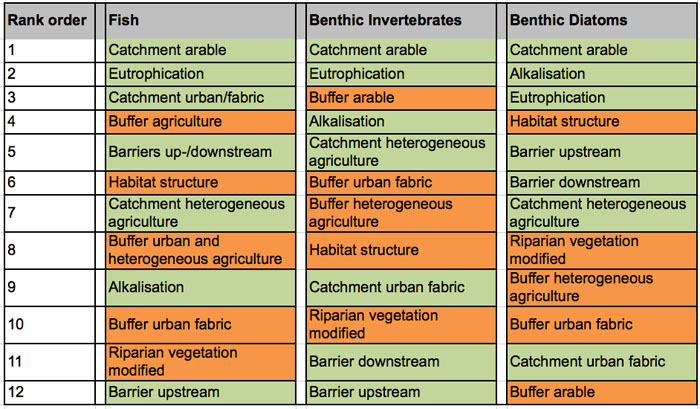 In particular the fish and macrophyte assemblages were found to be strongly influenced by habitat quality up to 10 km upstream (Table 1). Macroinvertebrate ecological quality was related to shorter stretches upstream (up to 2.5 km). Empirical analyses imply that about 1 km length upstream in a moderate or better physical habitat quality might suffice to promote biological recovery (see Lorenz in WISER Deliverable D5.1-2). Where broad-scale stressors impact ecological quality after restoration and may hinder recovery, such stressors require mitigation. Practitioners need to know the multiple stressors that may impact restoration candidate sites. They should prioritise those stretches that are least impacted by broad-scale stressors and thus may constitute stepping-stones within a broader restoration scheme. Local restoration measures need to be integrated into restoration schemes at the broad scale. This broad-scale and integrated restoration is well referred to by the WFD and termed 'River Basin Management'. Yet, it seems as if this broad-scale approach deserves more attention by scientists and practitioners in order to use the limited resources available most effectively for river restoration and management. For a detailed analysis of the effects of upstream physical habitat quality and land use conditions on ecological quality assessment at restored and unrestored sites see Lorenz in WISER Deliverable D5.1-2 (link to D5.1-2). Local restoration refers to the scale of single river sites or reaches, i.e. the scale of several tens up to hundreds of metres of river length (Table 1). This fine scale is typical for habitat enhancement (e.g. wood, boulder or gravel addition) or the removal of bank and bed fixation structures, re-meandering or re-braiding. Although such fine-scale measures typically result in quantifiable improvements of habitat quality and diversity, they rarely result in notable improvements of the ecological quality. Neither structural community characteristics (e.g. richness and diversity measures) nor functional attributes (e.g. feeding types) show general improvements after habitat enhancement or other morphological restoration. Furthermore, fine-scale habitat enhancement is often found to be ‘spoiled’ by natural dynamic processes, such as excessive erosion and sedimentation after floods, which easily can reset habitat conditions back to the state prior to restoration. This is the case when hydrological and morphological restoration targets do not fit the landscape characteristics (e.g. discharge dynamics, sediment type, slope). Restoration at the fine scale often failed to improve ecological quality (low uncertainty) (e.g., Palmer et al. 2010, Feld et al. 2011). There is less evidence for the underlying reasons. Frequently, it is assumed that local habitat improvement does not address broad-scale stressors and thus cannot initiate ecological recovery as (high uncertainty). This assumption may sound trivial, yet remains untested. ‘Larger’, more extensive restoration measures, which in parallel improve the in-stream habitat heterogeneity and overall channel patterns at the segment scale, are more likely to improve fish, macroinvertebrate and macrophyte assemblages at the same time (see Lorenz in WISER Deliverable D5.1-2). Methodological drawbacks may render habitat enhancements ineffective (see Feld et al. 2011 for example references). Wood additions, for instance, were found to be destroyed, buried under fine sediments or removed and transported further downstream even after moderate flood events (5 years recurrence interval). Spawning gravel additions were rapidly covered by fine sediment layers and made them useless for gravel-spawning fish (e.g. salmon, trout, nase). River restoration practice is a story of both success and failure. The manifold examples of restoration failure studies suggest that the design and planning of local habitat enhancement and other fine-scale restoration requires careful consideration of broader landscape characteristics (Figure 1). Not only must practitioners consider the stressors in the catchment upstream, but also the geomorphic (natural) landscape features, such as precipitation, geology and slope. The discharge dynamics, for instance, will largely control riverine processes such as erosion and deposition. Excessive fine sediment loads originating from agricultural land use on the floodplain will inevitable affect the availability of coarse substrates on the river bottom. A step forward to overcome these broad-scale constraints from natural landscape settings and human landscape modifications might be to better adapt restoration to these constraints. Individual measures should be designed ‘broader’, probably at the scale of river segments of several kilometres or even tens of kilometres of lengths. This might be supported by rather technical mitigation measures such as the fixation of large pieces of wood with wire or the trapping of fine sediments at specifically designed (wide and flat) river sections above. Where landscape characteristics potentially disturb specific habitat restoration measures, such measures should not be implemented, unless the mitigation of adverse landscape effects is appropriately addressed. Palmer, M.A., Menninger, H., & Bernhardt, E.S. (2010) River restoration, habitat heterogeneity and biodiversity: A failure of theory or practice? Freshwat. Biol. 55 (Suppl. 1), 205–222. The assessment and monitoring of the ecological status of rivers and other surface waters is explicitly referred to in the WFD and hence constitutes a basis for all River Basin Management Plans (RBMPs). River Basin Managers and practitioners are informed about the stressors to be assessed, the BQEs to be used for monitoring and the frequency of monitoring events with regard to each individual BQE. In contrast, the monitoring of restoration and management measures is neither specifically referred to in the WFD, nor is it sufficiently defined elsewhere. The general approach to date is to apply operational monitoring to assess restoration effects. Changes due to restoration often remain dubious as practitioners miss to sample and record the ecological status of a restoration candidate prior to the implementation of measures. Consequently, the knowledge about the specific requirements of restoration measures that determine restoration success or failure is humble due to the lack of appropriate restoration monitoring schemes. The lack of appropriate monitoring schemes is obvious. A review of 160 restoration studies revealed two major shortcomings (Feld et al. 2011): First, restoration monitoring is often poorly designed and hence inappropriate to reliably assign any detected change (or non-change) to restoration. 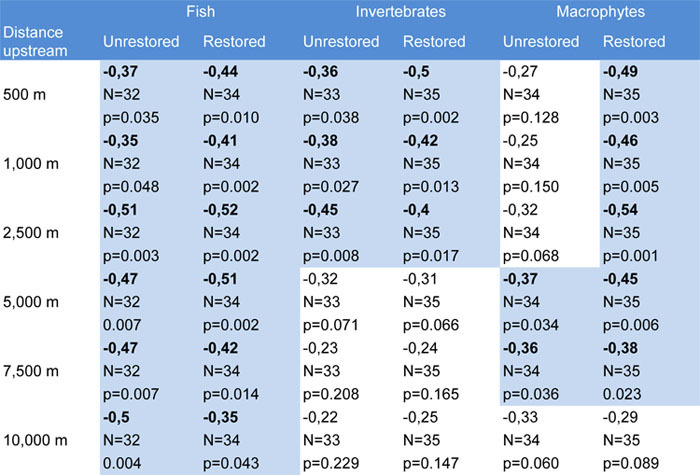 And second, the status before restoration is rarely being monitored, while the monitoring duration is limited to 3-4 years: Thus, long-term effects (>7-10 years) of restoration remain unknown for the majority of studies (Feld et al. 2011). The lack of restoration monitoring is likely to continue within the first management period of the WFD (until 2015). This, in part, becomes evident from the selection of RMBS's analysed for WISER deliverable D5.1-2 (see Verdonschot et al. therein). Although the selection represents only a small part of Europe, the considered RBMPs concordantly prove that little attention has been assigned to additional research and monitoring until 2015. Moreover, the RBMPs imply that practical restoration is primarily planned for the second and third monitoring period of WFD, which means that the existing knowledge gaps with regard to the reasons for success and failure of restoration remain presumably persist. River Basin Management involves huge efforts for and investments in restoration and mitigation measures in the future, presumably for the next couple of decades. As these investments in the environment compete with other society's demands, it is necessary that any bit of these investments is being spent efficiently. Sufficiently simple, but 'smart' monitoring designs might help scientists and practitioners fill the knowledge gaps (compare Feld et al. 2011 and WISER deliverable D5.1-2). First at least one sampling event prior to the implementation of measures is required to define the ecological status before restoration. Furthermore, an unrestored river stretch upstream to the restored section is required as control in order to be able to detect the degree of temporal variability within the river system. The full design is called BACI (before-after-control-impact) and can be considered the method of choice in restoration monitoring (Feld et al. 2011). Second, in addition to the WFD assessment and monitoring tools, more thorough records of hydrological, morphological and biological changes after restoration are required to better detect the multiple effects of individual restoration measures as well as their interactions. And third, restoration monitoring must help inform practitioners about both the short- and long-term changes after restoration. The comparison of selected RBMPs in Austria, France, Germany and the Netherlands is presented by Verdonschot et al. in WISER Deliverable 5.1-2. Species distributions are driven by environmental conditions, be it natural landscape settings or environmental stress induced by human activities including Climate Change. The Intergovernmental Panel on Climate Change predicted changes in temperature and precipitation in Europe for the periods 2020-2030 and 2050-2060. These changes are expected to greatly alter the distribution of fish, by providing more suitable habitats for species tolerating or preferring warm water, and by restricting species adapted to cold water habitats; the latter are expected to decline or even go extinct some regions of Europe. As these changes may also affect fish assemblage metrics in use at present for assessment and monitoring purposes, this implies that the reference condition baselines use to assess the ecological status of rivers based on fish would not be adequate in the future. Empirical evidence of these changes was shown by the study conducted downstream of lake outlet flow in the Traun river. During the last three decades the water temperature increase by on average 2.2 °C in August. This increase led to unsuitable thermal conditions for the grayling (Thymallus thymallus), which was historically present in this area. Consequently the grayling population greatly decline in favour of more adapted species such as barbel (Barbus barbus, Figure 1). Depending of the individual species considered, the accuracy of species distribution models (SDMs) may be very variable (Figure 2). In general, the models on species with a narrow and distinct temperature niche, i.e. both cold water and warm water-adapted species (e.g. bleak, Alburnus alburnus) are more accurate. In lowland catchments (e.g. the Seine basin in France), the absence of possible thermal refugia in the upstream part of the catchment may amplify the risk of regional species extinctions (Figure 3). Climate Change effects have to be taken into account in River Basin Management, for instance when using reference conditions as baselines for assessment or when designing restoration measures. If salmonid species, for example, go extinct in particular catchments, this requires consideration when setting the biological assessment reference in that catchment, or when defining the biological goals for restoration. Without consideration of Climate Change impacts, assessment runs the risk of misclassification. To evaluate such potential shifts, a monitoring network of reference sites in Europe may help inform the practitioners about potential consequences of global warming and its effects on both the biota and its abiotic environment. The climate change effects on fish BQE (species and metrics) is presented by Logez et al. in WISER deliverable 5.1-3. Logez, M., Bady, P. and Pont, D. (2011), Modelling the habitat requirement of riverine fish species at the European scale: sensitivity to temperature and precipitation and associated uncertainty. Ecology of Freshwater Fish 21: 266-282.